This, the third and final film in renowned ethnographic filmmakers David and Judith MacDougall’s classic Turkana Conversations Trilogy, investigates the views of the Turkana, and especially Turkana women, on marriage and polygyny. 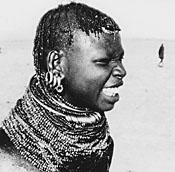 As the plans for a marriage in a nearby homestead unfold, the film explores why a Turkana woman would want her husband to take a second (or third) wife, and how the system of polygyny can be a source of solidarity among women while at the same time it may brutally disregard individual feelings. The Turkana women are well aware of the contradictory problems associated with individual liberty and communal survival. The film admirably demonstrates how Turkana culture — and, by extension, human culture — is a living thing, shaped by the people who carry it. In Turkana, with English subtitles. Note: Our DVD copies are now made directly from a newly restored and scene-by-scene color-corrected digital master painstakingly created by the filmmakers from their original 16mm film footage. Customers who previously purchased DVD copies should contact us for special discounted upgrade pricing on new copies.